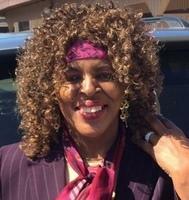 Audrey Annah Williams, Nov. 6, 1954 – July 12, 2015, Resident of Greenfield lost her battle. Audrey was born in Vicksburg, Mississippi. She was married to her wonderful husband, Melvin Lee Williams for 43 years. She has four children, Melvin Jr., Ganya, Tye and Alanya. She has three grandkids and two on the way. She was a local Gospel radio announcer along with her husband Melvin and was known and heard throughout the world. She started out at KNRY Radio Station, located on Cannery Row in Monterey. Her call name was “God’s Radio Angel”. Her husband is well known as “Deacon Melvin Williams”. They broadcast the Saturday Morning Gospel Hour, 5-7 am [PST], Holy Hip Hop on the Block, 10 am to Noon [PST] on Saturday, and the Sunday Morning Gospel Train, 5-9 am [PST]. Visitation services will be held at Bayside Community Mortuary Chapel, 1610 Noche Buena Street, Seaside on Friday, July 24, 2015 from 4 p.m. to 8 p.m. Church services will be held on Saturday, July 25, 2015 at the Christian Memorial Church of God and Christ at Fort Ord at 11:00 a.m.